The site's section on making friends covers a lot of information. This article will provide a quick summary of the core action-oriented tasks that come out of it. It won't cover the 'how to' or principles behind each step. That's for the articles which cover those topics themselves. Here I'll just provide an overview to focus what you need to do in the real world once you've read up on the advice. 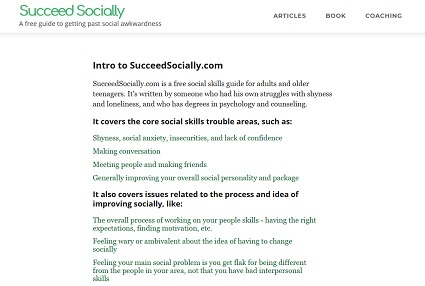 Out of the main social problem areas this site covers, building a social life lends itself most easily to creating a To Do list of specific tasks. There are clear behavioral steps to making more friends, and the end goal is tangible and measurable. We usually have a good sense of whether our social life is where we want it to be, both in terms of the quality and quantity of our relationships. Compare this to a much vaguer goal such as 'feeling more confident'. Spend some time researching your community, so you'll have a sense of places where you could meet people, or invite people to hang out if you organize a plan. What are some of the good coffee shops, restaurants, bars, and clubs in the area? Where could you see a movie or concert? Where could you play sports or do something outdoorsy? What kinds of classes or lessons are available to sign up for? What types of annual events come through town? Although I'm presenting this as a one-time task, it never hurts to periodically refresh your knowledge of your town or city. There's always more to find out about. With this step and the next, resist any urges to be overly picky when evaluating options. Some people have a tendency to declare there's nothing good where they live. Could you sign up for that drawing class you've always been interested in? Could you make an effort to drop by your friend's poker game that he's always talking about? Could you join a casual sports league? Could you drop by some events from Meetup.com? Sign up for those lessons, or drop by that poker game. ...you have some generally anxiety around trying to meet new people - You may want to refer to the site's section that covers fears and anxiety. This article on worries people have about making friends may also be helpful. ...a specific option you want to pursue makes you particularly nervous (e.g., the idea of going to a party and starting conversations with people makes you feel tense). Again, you may want to check out the site's advice on dealing with fears and nervousness. You could also try an easier method for meeting friends for now. ...it will be hard to free up time to pursue new interests. This is a case where you have to decide where your priorities lie. ...you're feeling particularly stuck in a rut, and can't imagine trying anything new. In some situations, like meeting your friend's friends, this step will be almost automatic. In others you'll have to take the initiative to strike up a conversation. 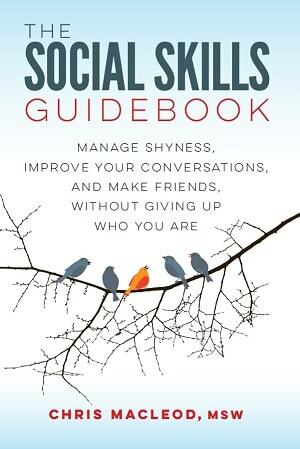 This step can be tricky for a lot of reasons, such as shyness, weaker conversational ability, and general social traits and habits that get in the way of your connecting to people. One way to make this step more manageable is to focus on the types of people you have an easier time talking to and conversing with. It's also important to realize that no matter what you do, you won't get along with everyone. This could be their phone number, email address, or Facebook user name. Some people feel a little uncomfortable asking someone for this information, since they fear rejection. For example, you may see a new co-worker again on future shifts, or continue to hang out with a friend's friend on group outings. This one varies. Some potential friends you'll see often enough that you don't need to text them or talk to them on Facebook. Similarly, if you've met someone once and seemed to get along, sometimes you'll follow up and invite them out fairly quickly. However, in some cases you'll need to keep on their radar by staying in touch. Once again, some people fear rejection here, or worry they're bugging the other person with their unwanted contact. Whether you're likely going to see someone again automatically, or whether your initial meeting with them could be your last unless you follow up, it's important to invite potential friends to hang out. First you have to think of some things you could do with them. This isn't a step you need to overthink. Standard choices like grabbing some drinks, spending time with a group of other people, going for a bike ride, or seeing a movie are often fine. This could be a one-on-one outing, or a group event where you pull together a bunch of prospects at once, or you hang out with some existing friends and one person you'd like to get to know better. Again, some people fear rejection here. They may also not know how to invite someone out. They may also stumble while trying to put a plan together. There's also the matter of how well things will go once you're actually hanging out with them. Here things like conversational ability, your personality, and your ability to connect with others will come into play. This is ambiguous territory. The person could not be interested in knowing you better, or they could have just been busy, or what you suggested wasn't their style. It never hurts to try again a few more times. Where you stand will usually become clearer with more information. If it later turns out the person doesn't want to be friends with you, continue to try to meet new people. It can't pan out with everyone. Some people are uncomfortable following up in the face of apparent rejection. This is the part where you actually grow the friendship. Again, some relationships may fizzle out for various reasons. It's unavoidable. Some friendships grow easily. In others people continue to deal with their insecurities and fears of rejection (e.g., even the ninth time inviting someone to hang out, they worry about being turned down). Some people also have trouble getting to know others on a deeper level. This involves repeating many of the steps above as necessary. I find this stage varies in how it goes. Some people get on a roll and have an easier time making even more friends, once they've established that base of confidence and the assuredness that comes from knowing you already have some kind of social life. Other people slow down once they've got some friendships going. In some cases it's because they're satisfied with the small social life they've built. For others they may actually be happier if they continued to get out there, but they've got just enough going on that they get lazy and complacent. Try making friends with people you're interested in, but feel more uncomfortable around. Try out ways of meeting people that previously made you nervous. Try taking on more of a central organizer role, and seeing what opportunities come of that (e.g., putting together a recreational soccer team, throwing a big party for all your friends, arranging a big trip to a restaurant at work). These steps are more advanced, however they're not too bad, especially if you've already built up some experience in making friends.